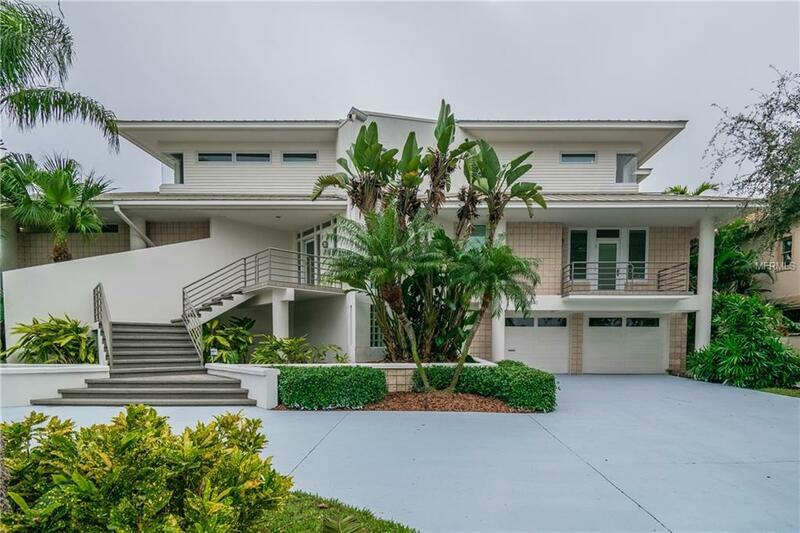 Captivating contemporary single family residence incorporates all the requirements of modern living. Located in Bayway Isles; gated community provides both privacy and security. Designed and built in 1995, this 4-bedroom, 4-full bath, 2-half bath home offers 5,920 sq. ft. of interior space. Beautifully detailed; impeccable condition; 3-levels with elevator. First floor features play room with bath. Second floor living space is bright and airy; open floor plan with gourmet chef-inspired kitchen; breakfast bar; spacious living room and dining room area; fantastic water-views; tile/carpet flooring. 3-bedrooms each with fabulous spa-like bath; laundry room. Opulent master suite on third floor with resort-like master bath and bidet; family room; office with bath; balconies with seemingly endless water views. The outdoor enthusiast will be delighted with tiled patio; abundant space for play, entertaining or relaxing; in ground pool; new resurface dock with 30,000 lb boat lift. Lush landscaping; 2-car garage can accommodate 4 cars. Freshly painted; new carpeting.